NEW BRITAIN - Trailing 3-2 and facing a loss to Platt on Wednesday, the Hurricanes needed a hero to step up and steal a win. Instead, they got two heroes. 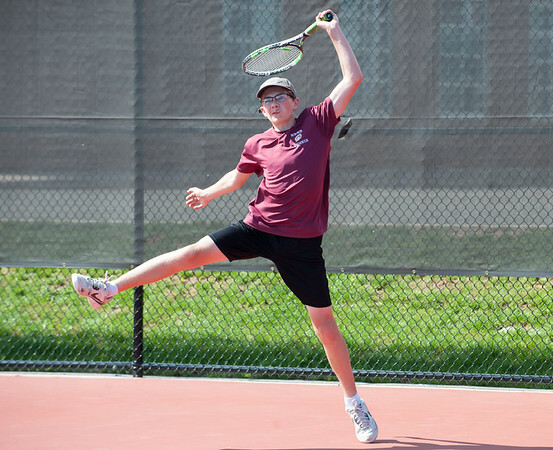 Sebby Tarasick and Adam Gottner each secured thrilling singles matches via tiebreakers on the final two matches of the afternoon to lift the Hurricanes to their first win of the season. The final match came down to Gottner, who came away with a thrilling 10-7 win in the tiebreaker after Tarasick won 10-2 in his own tiebreaker. The wins also completed a singles sweep for New Britain, after Platt took all three doubles matches. Newington 7, Bristol Central 0: The Indians rolled their way past the .500 mark with a sweep of the Rams for their second win of the season, thanks to dominant play in both singles and doubles. Sean Davis started things off for Newington with a 6-1, 6-0 win over David Gao, and Videep Soni followed with a convincing 6-2, 6-0 win over Paul Kjornrattanawanich. On the doubles side, Atteb Rahman and Marc Pantano won 6-1, 6-1 over Kenni Cantarero and Sebastian Kania, while Grant Garcia and Jake Cardines won their match by the same scores. Newington 6, Bristol Central 1: Much like the boys team, the Indians cruised to an easy victory over Bristol Central on Wednesday to move to 2-0 on the season. Newington was helped by flawless wins from Mara Klin and Abby Molloy, who each won their singles matches 6-0, 6-0. Kelley Iskra and Samantha Miller won the second doubles match 6-1, 6-0, and Anusha Singh and Dami Killanin defeated Julia Raduk and Ava McCann 6-1, 6-1 to cap off the lopsided win. Newington 7, Middletown 6: Trailing 6-5 in the bottom of the seventh, the Indians rallied to shock Middletown thanks to timely hitting and timely mistakes by the Blue Dragons, who threw a wild pitch to send across the winning run for Newington. Rachel Thureson led off the seventh with a single for the Indians, and was drove in with a double by Dani Pantano, her fourth hit in as many at-bats. With the game tied, Maddy Ellis ripped a single, and a rattled Dominique Highsmith walked the next two batters before a wild pitch scored Maya Johnson, who was pinch running for Pantano. Ellis and Thureson each finished with two hits for Newington. Maloney 10, New Britain 6: The Hurricanes held a 6-4 lead heading into the bottom of the third, but Maloney responded with a five-run third and held on for a 10-6 win at home. Josleen Rivera took her first loss of the season in the circle, while Milytzka Perez earned the win for Maloney and ripped a triple at the plate. Southington 14, Tolland 0 (5): Southington exploded for 10 runs in the fourth and fifth innings to win an abbreviated 14-0 blowout, sending everyone home after five innings in shutout fashion. Andrew Paradis led the offense with two hits and an RBI, while reaching base in all four at-bats. Bryce Worth recorded two hits and an RBI himself, and added a run scored. The thorough beatdown continues the Blue Knights’ strong start to the season, as they hold a perfect 4-0 record. Wethersfield 3, New Britain 0: The Hurricanes are still searching for the program’s first win after being swept by a tough Eagles team that has yet to lose this season. Oscar Carmona recorded five assists and five digs for New Britain, while going 10-for-10 from the service line. The Hurricanes, who continue to improve on the game’s fundamentals as a new team, made just one service error the entire match. Middletown 188, New Britain 223: The Hurricanes are still searching for their first win of the season after losing to Middletown on Wednesday, as Nick Turner recorded the best score for the Blue Dragons by shooting a 44. Middletown recorded the second and third best scores on the day as well, while Arthur Bell led New Britain with a 51. Manny Benitez and Dylan Washington rounded out the Hurricanes’ top three with scores of 55 and 57, respectively. Posted in New Britain Herald, New Britain, Newington, Southington on Wednesday, 10 April 2019 21:17. Updated: Wednesday, 10 April 2019 21:20.